When you need your chainsaw sharpened, you want it to be done right. While there are more chainsaw sharpening options out there than ever before and quite a few good options among them. But You can’t settle for good when you need the best. Below we have reviewed the best chainsaw sharpeners. We have chosen these models for their durability, ease of use, value, ability to cut different types of chains, and all-around quality. Oregon 410-120 is a complete automatic sharpener kit for sharpening chainsaws in the shop comes with grinding wheels and features a work light and other useful features, such as a wear indicator to let you know when to change out your grinding wheels. It has been constructed from durable cast aluminum and features the ability to be mounted to your wall, or to your bench. This will give anyone more versatility in the longer run. 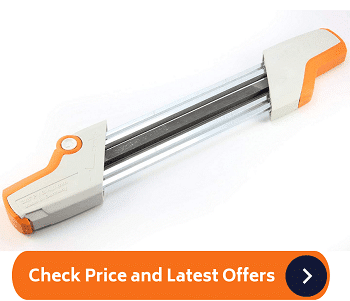 The light and the one-way rotational motor has been designed for your safety. Since it has this motor, you have more accuracy as well. Compared to many of the other elite options, this one has more adjustments and will ensure a lot of versatility. A longer nose life means you will be saving in the long run as well. Although this model doesn’t come cheap, it’s extremely powerful, fast, and versatile. On top of that, all of its guides and adjustable parts make it easier to use, whether you’re a first-timer or an old timer. The Timber Tuff CS-BWM Benchtop is one of the very best options on the market today. Designed from top quality steel, you won’t need to worry about the sharpener actually moving around when it has been securely mounted. The chainsaw has been designed with a 230-watt, which is ample power for any chainsaw blade. It can reach a massive speed of 3600 RPM and the 70-dB noise level is one of the lowest. This means the chainsaw can effectively be used when it comes to silent areas as well. With 3 different grinding blades at your disposal, you can use it for much more than simply sharpening your chainsaw. The plastic guard offers you a lot when it comes to protection. As for the price, it actually has a really affordable [price tag compared to most of the others. If you need great value for your money, this chainsaw will certainly offer you some great value. Unfortunately, we could not really find any real info on the warranty. If you are looking for a complete kit, the CO-Z Electric Chainsaw Sharpener Kit is one of the best options that you can choose. It has been constructed from durable cast aluminum and this has been reinforced to add a lot to the durability. With multiple adjustment angles ranging up to 30-degrees, the chainsaw will definitely ensure value. After being securely mounted, it is one of the easiest to operate as well. The durable safety feature features will ensure you are fully protected and a built-in light means you can work much more accurately. It also comes with 3 different blade mounts that should offer you some additional value for your money. As for the price, it is also really affordable. 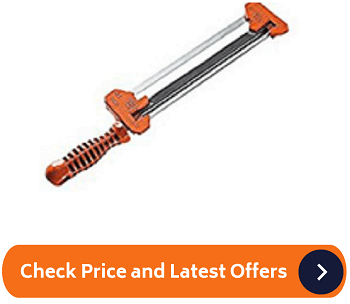 This means it is great for your expensive chainsaw without pushing up the combined price too much. The only real downside is that many people need to have it balanced correctly for more accuracy. However, this should not take too much time or effort if you have the right skills. Once again, we have another top quality elite option. 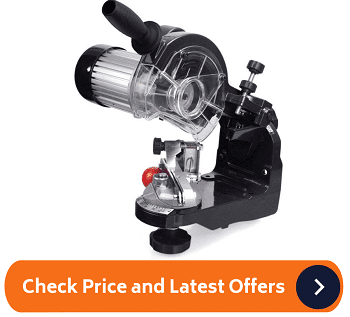 The Oregon 511AX Saw Chain Bench Grinder/Sharpener has a 285-watt single phase motor and offers you some excellent power when it has been securely mounted. The maximum speed is around 3400 RPM, which gives you a ton of versatility. Multiple adjustments have been included, while you still have the three most common blade types to choose from when you are looking for a new model. 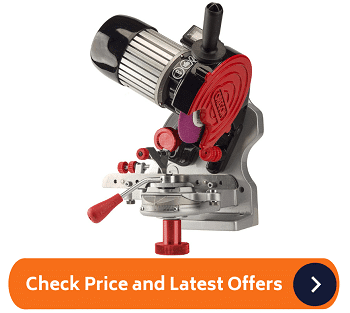 We have used this option for most of the top chainsaw models and it offers you some great value for your money. Unfortunately, it is one of the most expensive models on the market today. While it might be effective, it is designed for you to actually use it for more than simply sharpening your chainsaw. We recommend it for commercial use. 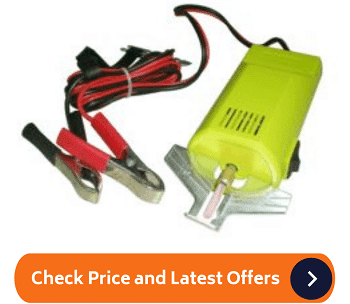 Last but certainly not least, we have the XtremepowerUS 85W Mini Electric Chainsaw Grinder Sharpener is an excellent option when it comes to affordability. With a decent 85-watt motor and 4200 RPM speed, it will ensure that you can easily sharpen all of your blades. Since it is also a really cheap model, virtually anyone can use it to ensure they get great value for your money. We could not really find a good warranty and the sharpener also lacks a little when it comes to the overall durability. If you find yourself strapped to a budget, this will be an excellent option to consider for your shed. The Timber-Tuff CS-12v 12 Volt Portable Electric Sharpener might just be one of the best options for a portable sharpener. It combines the power of an electric model with the portability of a mechanical one through one amazing innovation—and takes one of our top spots in the best electric chainsaw sharpener rankings as a result. What Makes the Timber Tuff CS-12v So Special? The difference between in this saw and other portable but electrically powered chain sharpeners is its ability to power itself from a 12-volt battery. Instead of plugging this unit into a wall, you can clip it onto a battery and go straight to work. 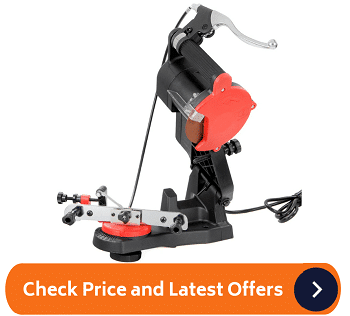 We love this model because it provides the power and ease of use of electric saw chain sharpeners with the portability of Timberline’s bar mounted, manually operated sharpeners. Although carrying a battery around will certainly increase the weight of your load, this saw sharpener is still much more portable than a lot of options out there, and still brings all the power you expect from plug-in models. For a middle-of-the-road choice between maximum power and maximum portability, this battery-powered sharpener is our go-to choice. You’ll never be stuck in the woods with a dull saw again—and that means that you’re going to stay safer and get more done every time you’re on the job. This handheld file sharpener brings all the benefits of its class, meaning it is extraordinarily lightweight and portable. It’s easy to use, and the files are durable enough to use around 15 times before changing them. 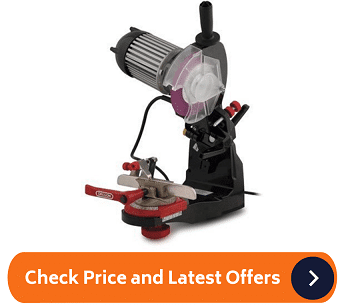 Although these sharpeners files require changing much more often than the grinding wheels on bench and wall mounted sharpeners, they are also a great deal cheaper. It’s also quite easy to carry extra files with you on long or tough jobs. 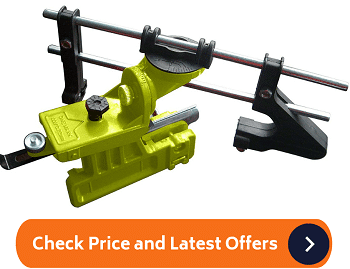 This manual bar mounted chainsaw chain sharpener works very well for its price and can cut a variety of saws. There are several different files available for this model so that you can get the best size for your needs. That being said, it isn’t the best middle-of-the-road option between portability and power. During our reviewing and testing process, we found one other manual bar mounted saw chain sharpener that performed a bit better. We also found a unique product from Timber Tuff, the brand that makes this unit, that really amazed us in several ways. The portable bar-mounted saw sharpeners from popular brand Timberline are some of the best manual bar-mounted sharpeners out there. Like the other bar mounted sharpeners reviewed above, Timberline’s sharpeners work via a hand crank while mounted on the bar of your chainsaw. Although this type of operation requires much less manual labor than a handheld file saw chain sharpener, the repetitive motion can still be tiring. That being said, it can get you great results—and the Timberline sharpeners allow you to custom-fit the right sharpener to your chainsaw of choice. 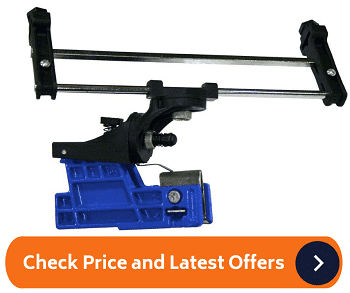 These models are not quite as easy to use as bench and wall mounted saw chain sharpeners and grinders—but you can bring them to work with you, while bench mounted models will obviously have to be left in the shop. This is a great handheld saw chain sharpener that brings plenty of versatility as well as a low weight and small size. It brings all the benefits of its class, meaning it is extraordinarily lightweight and portable. It’s easy to use, and the files are durable enough to use around 15 times before changing them. While Trilink bar-mount sharpener isn’t the absolute best out there, it’s certainly one of the better budget models available, especially in this class of sharpeners. It mounts directly on the bar of your saw and sharpens without you having to remove the chain. The cuts this saw sharpener makes are accurate, but this particular model can be a bit more difficult to use and less durable than the higher-end models. 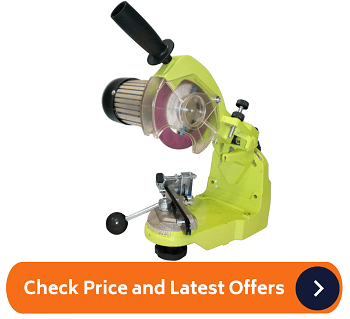 We would recommend it if you’re on a tight budget and immediately need a bar mounted saw sharpener, but not if you’re looking for the absolute best. What are your needs and the type of sharpener you need? How regularly do you need to sharpen chains? Do you normally use your chainsaw remotely outdoors or in a shop? Which Type is Best for you? While the 3 types are different, they’re not necessarily better or worse than one another—but one of the types is likely to suit your needs better. Determine what type of sharpener you need. Find the best model available of that type. These sharpeners draw a lot of power, meaning they can get the job done quickly and precisely. However, their large motors and physical design require them to be mounted to the wall or to a workbench, so they’re not portable at all. This type of sharpener is best for the professional who has a shop, especially if they have several different types of chainsaws. Bench and wall mounted sharpener is by far the most powerful and versatile available and require little manual effort to use. However, they are not at all portable, as they require an electric power source for operation. If you think a bench or wall mounted chainsaw sharpener is right for you, check out our reviews for the Oregon 410-120 and Oregon 511AX further below. While often not as powerful as the bench and wall mounted variety, and not as easily portable as the handheld type, bar mounted sharpeners strike a wonderful balance between power and portability. This is the newest type of sharpener, and many chainsaw users are attracted to them because of their ease of use and portability. This is arguably the most old-fashioned type. While this type of chainsaw sharpener requires a lot more manual labor than the other two kinds, it has some distinct advantages as well. First of all, handheld file sharpeners are cheaper. They contain fewer materials and no moving parts or electricity. This leaves more work for you, but it also means you can get a very high-quality product even on a tight budget. The biggest advantage of this type is their ease of portability. They are extremely small and lightweight, meaning you can carry them with you virtually anywhere and sharpen on the go. They are perfectly engineered for anyone working long hours remotely or on very large and spread out worksites. How to Sharpen Your Chainsaw? Once you’ve choosen the chainsaw sharpener for you, you’ll be ready to put it to work. Though all saw chain sharpeners work differently, there are a few basic guidelines you can follow. 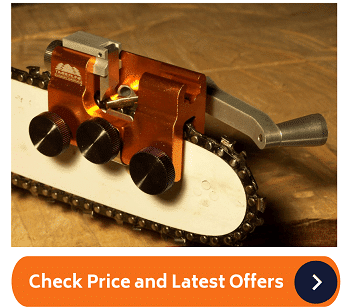 First, determine the gauge (size) of your chainsaw chain. This will let you know which grinding wheel or file size to select. Saws come in many sizes, but some common ones are 3/16”, 5/32”, and 7/32”. Next, take your time to complete a pre-sharpening routine. Clean your chain thoroughly, and make sure that none of the saw’s teeth are broken, chipped, or overly worn down. If they are, you should replace the chain. Next, stabilize your saw by putting it on a flat surface or clamping it in a vise. Stability is important to both safety and accuracy! When you start cutting, you should either locate the shortest tooth on the chain to use as a starting point or, if all teeth are the same length, mark the first tooth you sharpen so you’re sure to file all teeth down to the same length. Check for “witness markers” or look in the instruction manual that came with your saw to find the proper angle at which to sharpen your chains’ teeth. When you’re done with the sharpening itself, check the rakers (the curved hook links between the saw’s teeth) to ensure that they are slightly lower than the saw’s teeth. If they’re not, file or grind them down as well. Be sure to oil your chain and check its tension before cutting again! Wear protective gloves and eyewear to keep you from injuring yourself with the saw’s teeth or with metal filings. If you’re using a grinder, you’ll want to look out for sparks as well. If you’re sharpening your chain while it’s still on the saw, be sure your saw is empty of gasoline or that its battery is taken out. Though saws have various safety mechanisms to prevent them from starting, you can never be too careful. Work slowly—this will both improve your work and keep you safe ! !